Notes: The Chamois Nymph is generally attributed to George Bodmer of Colorado Springs, CO in the early 1960's . There have been some references that Bob Brooks, riverkeeper at Hot Creek in the 1980's, introduced this fly to the Eastern Sierra area. 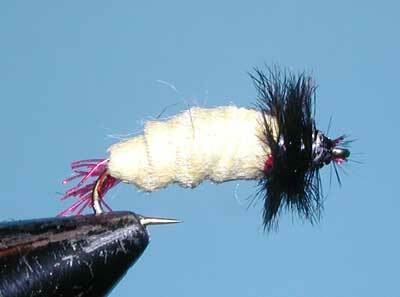 It remains a popular caddis pattern representing the Rhyacophila genus in it's nymphal form. An underbody is sometimes used, since the chamois can become translucent when wet. Underbodies of red or green synthetic flash are popular. A product from Hareline, known as Cohen's Fly Suede, has become a popular replacement for chamois since it is much thinner and softer.